﻿ Best Price on La Leona Eco Lodge in Carate + Reviews! Featuring a rustic-style decoration and located amid a tropical forest facing the Pacific Ocean, this certified eco-friendly property offers included breakfast. The bungalows at La Leona Eco Lodge have no electricity and are lighted with candles. They have plenty of ventilation and toiletries are provided. The bathrooms can be both shared and private. Playa Carate Beach is less than 1.9 mi from the property and guests may go hiking towards Corcovado National Park, which is less than 656 feet away. 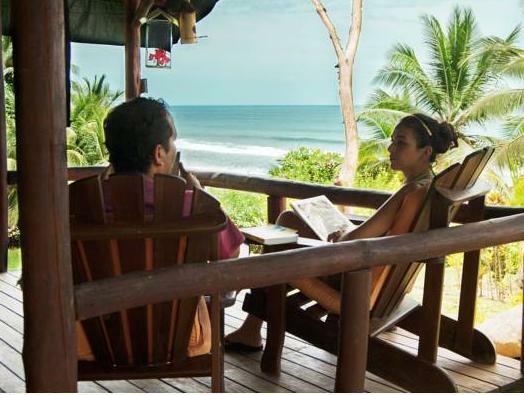 La Leona Eco Lodge features certified guides who give tours of the surrounding area. Carate Domestic Airport is 1.9 mi away. Guests are kindly requested to inform the hotel at least 3 days in advance of their estimated time of arrival. This can be noted in the Comments Box during booking or by contacting La Leona Eco Lodge using the contact details found on the booking confirmation. Parking is located 2.5 mi away an has a fee of $5 USD per day. Please inform La Leona Eco Lodge of your expected arrival time in advance. You can use the Special Requests box when booking, or contact the property directly using the contact details in your confirmation.